The first Jackbox Party Pack was a pleasant surprise for me, a cheap, clever compilation of digital board games that happened to get a price drop just before the holidays, just in time for me to spend some quality time making madcap antics with friends. I have some good memories of the games contained within that pack, especially Drawful and Fibbage, and the clever ways that they managed to turn ordinary cell phones into game controllers, letting anybody join in on the fun. Naturally, I jumped at the opportunity to try Party Pack 2 when I had the chance to take it home over the holiday. Looking to replicate the great times I had with the first game, I brought Party Pack 2 along to several get-togethers and let the good times roll. But while I definitely did have a good time with Jack’s second outing, it felt like the novelty had started to wear off, and a few of the games fell a little flat for my friends and I. Still, the pack provided me with several solid nights of fun, and some of the games in particular will almost certainly have me coming back in the future. Like its predecessor, Party Pack 2 is a compilation of five different board games, all of which are played using a combination of your television (or computer monitor) and your phone. Players join a game by visiting a website on their phone and entering a code displayed on the television screen. From there, each game is controlled from the phone, giving players access to their fancy touch screen during console gameplay. It’s a novel idea for sure, and it makes the games easy to control for everyone, but some of the shine has worn off since the first Jackbox debuted. Mobile games like Psych! feel a lot like the games contained within Jackbox 2, but eliminate the need for a console, television and $25 up-front purchase. A good game should hold up beyond mere novelty, though, and at its best Party Pack 2 succeeds at this. Fibbage 2, for example, is the first game you’ll see in the pack, and it’s a pretty worthy sequel to its predecessor. Not a lot has changed, necessarily – you’re still trying to create the most convincing lie to fool all of the other players – but there are more than 500 new questions, and the new deFIBrillator mechanic adds an interesting wrinkle to the game’s strategy. It doesn’t attempt to re-write the rules of the first Fibbage, but it doesn’t really have to; at its best, it’s still riotous fun for a bunch of friends. Another highlight is Quiplash XL, which coincidentally is also another pseudo-sequel to a classic Jackbox game. Good for between three and eight players, Quiplash XL is the kind of game that become exponentially better the more people you add. Unlike Fibbage, you’re not trying to lie or fool anybody. In this case, you’re just trying to come up with the funniest answer to a predetermined question, as voted on by your peers. You and one other person in the room will receive the same fill-in-the-blank sentence on your phone. Other people in the room will receive different prompts at the same time. Each prompt reads something like “The Egyptian Pyramids would be far more impressive if they contained _____”, or “A terrible theme for a high school prom”. You’re all given a short time to come up with the funniest answer you can, after which the game cycles through several rounds of voting, determining whose answers are funniest and doling out points accordingly. I loved Quiplash XL because it allowed for unlimited creativity, and let players go as dark, whimsical or silly as they wanted to in any given situation. Of all the games in this pack, it’s definitely the one I intend to revisit the most. Fibbage 2 and Quiplash XL are great, but they’re both pseudo-sequels to old Jackbox games. It’s when Party Pack 2 tries to introduce entirely new games that things become a little more uneven. Bomb Corp. is a good example of that. 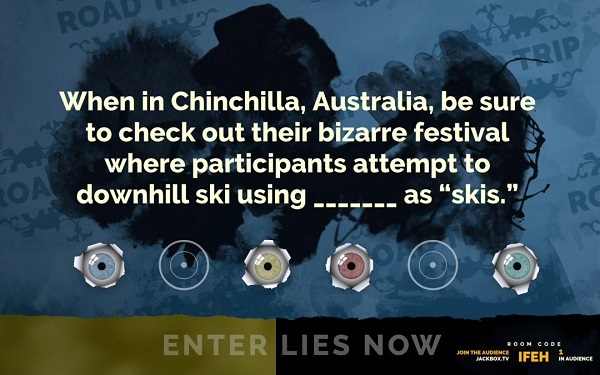 This game turns the usual Jackbox formula on its head, forcing players to cooperate to defuse bombs instead of competing to get a high score. Your team is cast as new employees at a bomb defusing factory, at which many, many jokes about exploding people are made. As a team, you must shout out and decipher the instructions written on your phones in order to help one another defuse the bomb displayed onscreen. It works in principle, but in practice you have to be in the right mindset and playing with the right group of people. The cutscenes that play between each round ended up annoying us, and made the experience feel a little uneven as a whole. Then there’s Bidiots, which was uniformly everyone’s least favorite game in the pack. The game attempts to riff on Drawful’s use of the touchscreen for drawing, but it muddies the rules so much as to become a tedious slog. Like in Drawful, you each draw a picture on your phone based on a prompt given to you by the game. But then you have to sit through tedious rounds of bidding, where AI characters will ask you to buy certain drawings for them based on a series of clues. 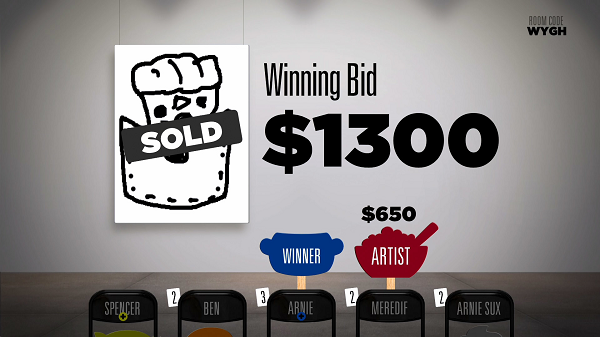 You often won’t be sure if the drawing you’re bidding on actually is the requested drawing, because not everyone in your group will have fantastic touchscreen drawing skills, a fact which confuses things further. You’re also forbidden from bidding above a certain amount of money on each drawing, and other players may be attempting to outbid you, so you’ll have to be crafty. There are other rules that dictate when and how much you should bet, but overall Bidiots feels like it has just one rule too many to keep track of during what is supposed to be a lighthearted, pick-up-and-play party. Luckily, the last game in the pack tows a solid line. Earwax sounds like a dud based on its description, but we all ended up having a decent time with it at the end of the day. Like Quiplash, Earwax gives you a prompt which you must answer in the most humorous or insightful way possible. But in Earwax, you can only use a sequence of two pre-recorded sounds to answer. The sounds are up to you to pick, and the number of players who like your response over your opponents determines how many points you get. It sounds like a pretty obscure game, and in fact it kind of is, but once I started playing I discovered its immediate appeal. The noises included are goofy and fun, and elicited a laugh from us plenty of times. The only downside is that sometimes, you just aren’t presented with noises that combine in any meaningful way, so certain rounds are predetermined to be duds. Jackbox Party Pack 2 suffers a bit from a lack of novelty when compared with similar mobile games, but it still manages to hold its own with a few fun sequels and a handful of decent, if not riotous, new additions. I know I’ll be coming back primarily for Fibbage and Quiplash, but should the mood strike you to explore something new, you could do much worse at a party than break out Jack’s latest additions. Thanks to the randomness ingrained with the other games that ensues no two sessions are alike, we could easily stick to the games we liked and still feel like The Jackbox Party Pack 5 was a great way to spend an evening with friends. If you are enamored with the retro arcade aesthetic that Party Hard has to offer, there could be some value here. Otherwise, it might be best to sit this party out altogether. For those with the original, the only meaningful addition to this entry are the custom prompts. Finally, mileage varies, depending on your friends and their sense of humor. If you’ve got a great group ready to have fun, then Drawful 2 will keep you entertained for hours on end.